Some of you may already be familiar with what economists call the "Cobra Effect". For those of you that are not, the story stems from the time of British Colonial rule in India. The British Government was concerned by an increase in snake attacks and put out a bounty for every dead cobra that was brought to them. This worked well initially with many wild cobras being caught and killed in order to gain the reward. However, some entrepreneurial locals soon realised that if they bred cobras in captivity, they could kill more of them more easily and earn more money with less effort. Eventually, word of this got to the British government who promptly cancelled the bounty. Of course, with no incentive to bred cobras, the local entrepreneurs simply released them into the wild which meant that there where more cobras after the bounty was cancelled than there had been before the bounty was introduced. Alternatively, you may have heard of the great Hanoi rat massacre. In the spring of 1902, the French colonial government found they had a rat problem. The smart modern sewers that they had introduced to the city of Hanoi, Vietnam, were teeming with rats which were now spilling out of the sewers. The solution they settled upon was remarkably similar to that employed by the British colonial government for their snake problem. They put up a bounty for rats, but only insisted that the rats tail be brought in before the bounty was paid out. Again, this brought in a flood of rats tails and officials hoped that they would soon have the problem under control, However, they soon began to see tailess but otherwise healthy rats all over the city. Resourceful locals would release the rats they caught after parting them from their tails so that they could live on and breed. The more rats there where, the more rats tails there where to harvest. Again there were instances of rat farms being set up by the more entrepreneurial which led to an ever increasing rat population and an even bigger problem for the French colonial government than there was before the introduction of the bounty. When behaviours that are not necessarily tied to the results that we want to see are measured and rewarded we can sometimes experience what we call perverse incentive. Perverse incentive is when an incentive creates a result which is against the interests of the incentive maker. It is because of this danger of perverse incentive that we need to be careful in our selection of Key Performance Indicators and how we subsequently link those indicators to reward. It is often said in business that "if you tell me how you'll measure me, i'll tell you how i'll behave". We need to make sure that our choice of KPI's links individual action to the goals and strategy of the business. 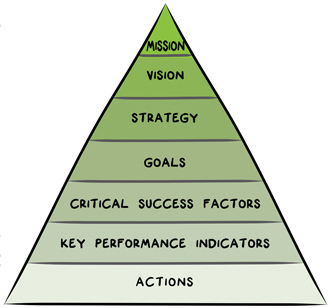 The following pyramid shows how individual action relates all the way back to the mission and vision of the business through KPI's. The challenge is to ensure that each element of the pyramid is properly aligned. How then can we make sure that the measures we choose align individual and group behaviours with the goals and strategy of the business? There are typically four processes involved in making this happen. If either crazy cobras or rampant rats are on the loose within your business as a consequence of poor linkage between your business objectives and your chosen KPI's, then contact Continuous Business Planning today. We can help guide you through the steps above and establish a clear line of sight from the top to the botom of your organisation of what you are doing and how the performance of each individual understands how their day to day performance contributes or takes away from the success of the business.